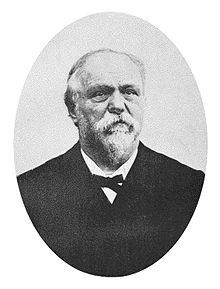 Georges Eugène Sorel (2 November 1847 – 29 August 1922) was a French philosopher and theorist of Sorelianism. His notion of the power of myth in people's lives inspired anarchists, Marxists, and Fascists. It is, together with his defense of violence, the contribution for which he is most often remembered. I have no reason to suppose that Lenin gained his ideas from my books; but if that were true, I should be not a little proud of having contribute to the intellectual development of a man who seems to me to be at once the greatest theoretician of socialism since Marx and a statesman whose genius recalls that of Peter the Great. Lenin may be proud of what his comrades are doing; the Russian workers are acquiring immortal glory in attempting the realization of what hitherto had been only an abstract idea…..
Engels feared that the Socialists, in order to gain adherents in the electoral struggles rapidly, would make promises which were contrary to Marxist doctrine. The antisemites told the peasants and the small shopkeepers that they would protect them from the development of capitalism. Engels thought that an imitation of this procedure would be dangerous, since, in his opinion, the social revolution could only be realised when capitalism had almost completely destroyed the small proprietors and small industries; if the Socialists, then, endeavoured to hinder this evolution, they would ultimately compromise their own cause. All the future of socialism resides in the autonomous development of workers’ syndicates. [Myths] are not descriptions of things, but expressions of a determination to act… A myth cannot be refuted since it is, at bottom, identical with the convictions of a group, being the expression of these convictions in the language of movement. Revolutionary syndicalism keeps alive the desire to strike in the masses and only prospers when important strikes, accompanied by violence, take place. And so I am not concerned to justify the perpetrators of violence but to enquire into the function of the violence of the working classes in contemporary socialism. Everyone explains that discussions about Socialism are exceedingly obscure; this obscurity is due, to a large extent, to the fact that contemporary socialists use a terminology which no longer corresponds to their ideas. It is very difficult to understand proletarian violence as long as we try to think in terms of the ideas disseminated by bourgeois philosophy; according to this philosophy, violence is a relic of barbarism which is bound to disappear under the progress of enlightenment. Proletarian violence, carried on as a pure and simple manifestation of the sentiment of class struggle, appears thus as a very fine and heroic thing; it is at the service of the immemorial interests of civilization; it is not perhaps the most appropriate method of obtaining immediate material advantages, but it may save the world from barbarism. We have the right to conclude from this that syndicalist violence, perpetrated in the course of strikes by proletarians who desire the overthrow of the State, must not be confused with the acts of savagery which the superstition of the State suggested to the revolutionaries of 93 when they had power in their hands and were able to oppress the conquered – following the principles which they had received from the Church and from the monarchy. We must not always attach too much importance to violent attacks on the bourgeoisie; they may be motivated by the desire to reform and to perfect capitalism. As the State formerly played a most important part in the revolutions that abolished the old economic systems, so it must again be the State that should abolish capitalism. Existing social conditions favour the production of an infinite number of acts of violence and there has been no hesitation in urging the workers not to refrain from brutality when this might do them service. It seems that it was the Jews who had entered the revolutionary movement who are primarily responsible for the terroristic measures blamed upon the bolsheviks. This hypothesis appears to me to be all the more reasonable given that the intervention of the Jews in the Hungarian Soviet Republic has not been a happy one. Sorel the Dreyfusard eventually developed into a bitter anti-semite, calling upon Europe to defend itself against the Jewish peril in the same way as America fought the Yellow peril; he blamed the Chekist terror on the Jewish members of the Bolshevik party.